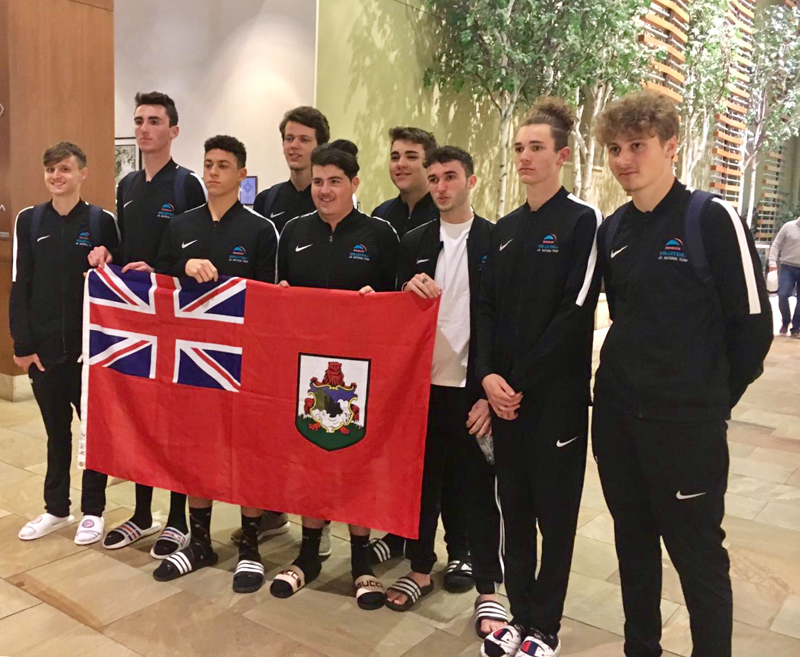 Bermuda’s Junior Boys National Volleyball Team returned home from the Mizuno Boston Volleyball Festival with their heads held high having earned their way into their age group’s top division and competing against the best teams from throughout the USA. The Festival, which took place from February 22-25, featured over 700 teams in youth divisions for boys and girls. Bermuda’s boys took part in the U18 age group that included 68 teams. On Day One the team started out by facing the top seeded team in their division and losing by a score of 15-25 and 23-25. Their second game was played against the fifth seeded team and this time Bermuda came away with a victory. An early victory on Day Two saw the Bermuda Team move up into the top division for the rest of the Festival where, Head Coach Denise Somerville says, the level of competition increased significantly. “Day Two was an extremely long day playing into the evening and despite the losses, the team’s defense, blocking and serving was on point throughout the day,” she says. On Day Three the team lost its first game but managed to take the second game to a third set before going down in the third and final set 9-15. They ended the tournament with a record of 5 wins and 9 losses placing 17th in their division. While participating in the competition, players were able to showcase their skills to coaches and scouts from NCAA Division 1, 11 and 111 colleges and universities, who identify players with potential for athletic scholarships. Coach Somerville says preparing for and traveling to events like these takes a big commitment from the players, parents and coaches and also support from the wider community: “We would just like to thank our sponsors for recognizing the commitment of the players and helping them take advantage of this amazing opportunity.” Sponsors of the team include BF&M, SignWorx, Vineyard Vines and Auto Solutions. The team that traveled to Boston consisted of nine players selected from the Bermuda Volleyball Association’s Junior National Programme. They are: Joshua Blee, Nathan Cabral, Steven Camara, Benjamin Edwards, Dimitri Guglielmucci, Seth Malpas, Aidan McPhail, Conor Sinclair and Connor Somerville [Captain].